Continue your education with Ashton College. We have flexible courses available to help you with professional upgrading, changing careers or simply expanding your learning horizons. As a life-learner, Continuing Education at Ashton means you are always looking to upgrade your skills, land that promotion or step into a brand-new career. At Ashton College, we can give you the tools to succeed with short courses designed to get you the most from your education. We deliver continuing education through innovation. Your instructors are industry professionals with years of experience to give you the benefit of a real-world education that you can start using right away. See where your learning could take you with Continuing Education from Ashton College. 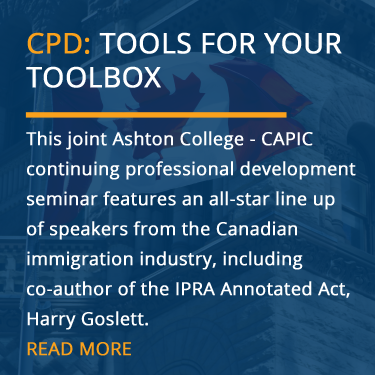 Regulated occupations in Canada require professionals to complete a set number of Continuing Professional Development (CPD) hours to continue their membership. Maintain your full-status membership and receive more than just CPD hours with Ashton College. Experience a higher level of learning and benefit from a lineup of relevant and timely topics, presented by distinguished experts. All seminar topics are intended to be broad spectrum so that the speaker can discuss relevant issues that can apply to your career. CPDs from Ashton College are delivered in-person and digitally. In-person seminars are conducted throughout the year in Vancouver, BC. Digital seminars are delivered LIVE online with the latest webinar technology, allowing you to connect to the speaker and your fellow attendees for an immersive, interactive learning experience. Our LIVE online sessions are also recorded and are available as a recorded video for convenient viewing. The CELPIP Preparation Program helps future test takers to prepare for the individual components of the CELPIP test (both CELPIP General and CELPIP-General LS). The program emphasizes the requirements and the expectations of each section of the test and increases students' chances of achieving their target score.